The African penguin (Spheniscus demersus), also known as the jackass penguinand black-footed penguin, is a species of penguin, confined to southern African waters. It is also widely known as the “jackass” penguin for its loud, donkey-like bray, although several related species of South American penguins produce the same sound. It is also widely known as the “jackass” penguin for its loud, donkey-like bray. Like all extant penguins it is flightless, with a streamlined body, and wings stiffened and flattened into flippers for a marine habitat. Adults weigh on average 2.2–3.5 kg (4.9–7.7 lb) and are 60–70 cm (24–28 in) tall. It has distinctive above the eyes and a black facial mask; the body upper parts are black and sharply delineated from the white underparts, which are spotted and marked with a black band. The pink gland above their eyes helps them to cope with changing temperatures. When the temperature gets hotter, the body of the African penguin sends more blood to these glands to be cooled by the air surrounding it. This then causes the gland to turn a darker shade of pink. The pink gland above their eyes helps them to cope with changing temperatures. 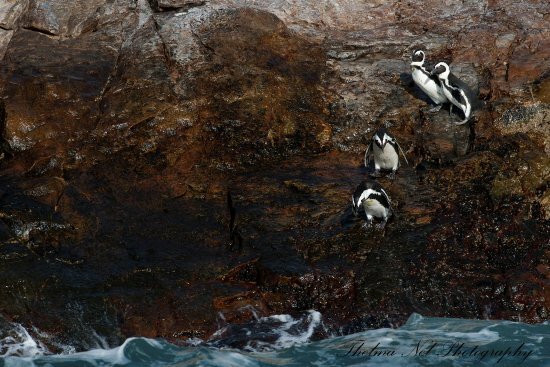 The African penguin is a pursuit diver and feeds primarily on fish. 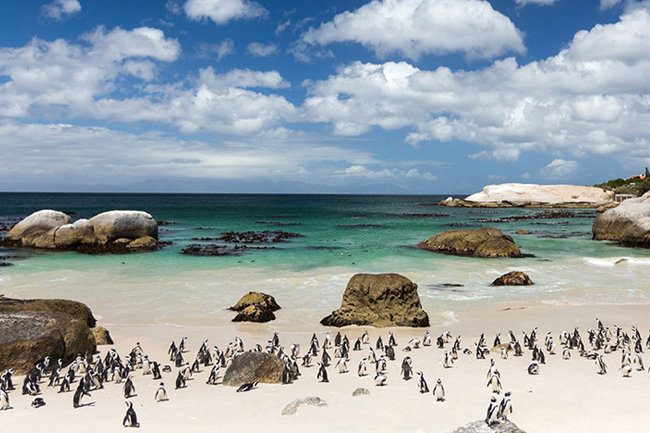 Two colonies were established by penguins in the 1980s on the mainland near Cape Town, namely Boulders Beach near Simon’s Town and Stony Point in Betty’s Bay. Mainland colonies probably only became possible in recent times due to the reduction of predator numbers, although the Betty’s Bay colony has been attacked by leopards. The only other mainland colony is in Namibia, but it is not known when it was established. Stony Point in Betty’s Bay. Tagged with:African Penguins, Algoa Bay, black-footed penguin, Boulders Beach, jackass penguin, Namibia, Port Elizabeth, pursuit diver, Simon's Town, South Africa, Spheniscus demersus, Stony Point in Betty's Bay., The African penguin is a pursuit diver, The pink gland above their eyes helps them to cope with changing temperatures.